The Reign of Terror (June 1793 – July 1794) was a period in the French Revolution characterized by brutal repression. The Terror originated with a centralized political regime that suspended most of the democratic achievements of the revolution, and intended to pursue the revolution on social matters. Its stated aim was to destroy internal enemies and conspirators and to chase the external enemies from French territory. The French Revolution began not only as a revolt against the monarchy, but had a strong anti-clerical streak as well. The revolutionaries were largely atheists, products of the Enlightenment. One of the more ironic developments then was the institute of a new cult of the "goddess of Reason." It was an attempt by the revolutionaries to "dress up" their atheistic views in the garb of religion in order to achieve the unifying benefits of religion. It was largely met with skepticism. The Terror as such started on September 5, 1793 and, as the Reign of Terror, lasted until the summer of 1794, taking the lives of anywhere between 18,000 to 40,000 people (estimates vary widely). Thousands would die by means of the guillotine, including many of the greatest lights of the revolution, like Georges Danton. In the single month before it ended, 1,300 executions took place. The deaths can be explained in part by the sense of emergency that gripped the revolutionary leadership as the country teetered on the brink of civil war. In the summer of 1793, the French Revolution was threatened both by internal enemies and conspirators, and by foreign European monarchies fearing that the revolution would spread. Almost all European governments in that era were based on royal sovereignty, whether absolute or constitutional, rather than the popular sovereignty asserted by the revolutionary French. Foreign powers wanted to stifle the democratic and republican ideas. Their armies were pressing on the border of France. Foreign powers had already threatened the French population with horrible retaliation if they did not free King Louis XVI and reinstate him as a monarch. Louis XVI himself was suspected of conspiring with foreign powers who wished to invade France and restore the absolute monarchy. The former French nobility, having lost its inherited privileges, had a stake in the failure of the revolution. The Roman Catholic Church was generally against the revolution as well, which (through the Civil Constitution of the Clergy) turned the clergy into employees of the state, requiring that they take an oath of loyalty to the nation. About half the clergy, mainly in western France, refused the oath, making themselves known as refractory priests or non-jurors. Catholic priests and the former nobility entered into conspiracies, often invoking foreign military intervention. In the western region known as Vendée, an insurrection led by priests and former nobles and supported by Great Britain began in the spring of 1793. The extension of civil war and the advance of foreign armies on national territory produced a political crisis, increasing the rivalry between the Girondins and the more radical Jacobins, with the latter having the support of the Parisian population. On June 2, Paris sections—encouraged by the enragés ("enraged ones") Jacques Roux and Jacques Hébert—took over the French Convention, calling for administrative and political purges, a low, fixed price for bread, and a limitation of the electoral franchise to sans-culottes alone. With the backing of the National Guard, they managed to convince the convention to arrest 31 Girondin leaders, including Jacques Pierre Brissot. Following these arrests, the Jacobins gained control of the Committee of Public Safety on June 10, installing the revolutionary dictatorship. On July 13, the assassination of Jean-Paul Marat—a Jacobin leader and the mastermind of the September 1792 massacres—by Charlotte Corday, a Girondin, resulted in further increase of Jacobin political influence. George Danton, the leader of the August 1792 uprising against the king, having the image of a man who enjoyed luxuries, was removed from the committee and on July 27, Maximilien Robespierre, "the Incorruptible," made his entrance, quickly becoming the most influential member of the committee as it moved to take radical measures against the revolution's domestic and foreign enemies. Meanwhile, on June 24, the convention adopted the first republican constitution of France, variously referred to as the French Constitution of 1793 or Constitution of the Year I. It was ratified by public referendum, but never applied, because normal legal processes were suspended before it could take effect. Facing local revolts and foreign invasions in both the east and west of the country, the most urgent government business was the war. On August 17, the convention voted general conscription, the levée en masse, which mobilized all citizens to serve as soldiers or suppliers in the war effort. On September 5, the convention, pressured by the people of Paris, institutionalized The Terror: systematic and lethal repression of perceived enemies within the country. La terreur n'est autre chose que la justice prompte, sévère, inflexible. ("Terror is nothing other than prompt, severe, inflexible justice.") (Robespierre). The result was a policy through which the state used violent repression to crush resistance to the central government. Under control of the effectively dictatorial committee, the convention quickly enacted more legislation. On September 9, the convention established sans-culotte paramilitary forces, the revolutionary armies, to force farmers to surrender grain demanded by the government. On September 17, the Law of Suspects was passed, which authorized the charging of counter-revolutionaries with vaguely defined crimes against liberty. On September 29, the convention extended price-fixing from grain and bread to other essential goods and fixed wages. Another anti-clerical uprising was made possible by the installment of the French Revolutionary Calendar on October 24. Against Robespierre's concepts of deism and virtue, Hébert's atheist movement initiated a religious campaign in order to dechristianize society. The climax was reached with the celebration of Goddess "Reason" in Notre Dame Cathedral on November 10. The Reign of Terror was able to save the revolutionary government from military defeat. The Jacobins expanded the size of the army, and Lazare Carnot replaced many aristocratic officers with younger soldiers who had demonstrated their ability and patriotism. The republican army was able to throw back the Austrians, Prussians, British, and Spanish. At the end of 1793, the army began to prevail and revolts were defeated with ease. The Terror became identified with ruthless, centralized revolutionary government. The economical dirigiste program didn't solve the problems. Suspects' goods were confiscated by the Decrets of Ventôse (February–March 1794), in order to prepare for the redistribution of wealth. Because dissent was now regarded as counterrevolutionary, extremists such as Hébert and moderate Montagnards such as Danton were guillotined in the spring of 1794. On June 7, Robespierre, who had previously condemned the Cult of Reason, advocated a new state religion and recommended the convention to acknowledge the existence of God. On the next day, the worship of the deistic Supreme Being was inaugurated as an official aspect of the revolution. Compared with Hébert's popular festivals, this austere new religion of virtue was received with signs of hostility by an amazed Parisian public. The guillotine, a device used for carrying out capital punishment by decapitation, was a main tool used during the Terror. It consists of a tall upright frame from which is suspended a heavy blade. This blade is raised with a rope and then allowed to drop, severing the victim's head. The device takes its name from Joseph-Ignace Guillotin, a French physician and member of the Revolutionary National Assembly, on whose suggestion it was introduced. Dr. Guillotin proposed the use of a mechanical device to carry out the death penalty. The guillotine was adopted as the official means of execution on the March 20, 1792. The guillotine was used to execute many key figures, including Queen Marie-Antoinette, the Girondins, Philippe Égalité, despite his vote for the death of the king, Madame Roland, and many others. The Revolutionary Tribunal summarily condemned thousands of people to death by the guillotine. Mobs beat some victims to death. Sometimes people died for their political opinions or actions, but often for little reason whatsoever beyond mere suspicion, or because some others had a stake in getting rid of them. Most of the victims received an unceremonious trip to the guillotine in an open wooden cart (the tumbrel). Loaded on these carts, the victims would proceed through throngs of jeering men and women. 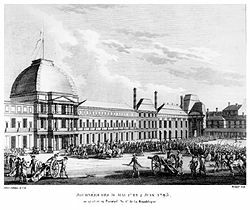 At this time, Paris executions were carried out in the Place de la Revolution (former Place Louis XV and current Place de la Concorde—near the Louvre); the guillotine stood in the corner near the Hôtel Crillon where the statue of Brest can be found today. For a time, executions by guillotine were a popular entertainment that attracted great crowds of spectators. Vendors would sell programs listing the names of those scheduled to die. Regulars would come day after day and vie for the best seats. Parents would bring their children. By the end of the Terror the crowds had thinned drastically. Excessive repetition had staled even this most grisly of entertainments, and audiences grew bored. The centralization of repression also brought thousands of victims before the Paris Revolutionary Tribunal, whose work was expedited by the draconian Law of 22 Prairial (June 10, 1794), which had led to the Terror. As a result of Robespierre's insistence on associating terror with virtue, his efforts to make the republic a morally united patriotic community became equated with the endless bloodshed. Finally, after the decisive military victory over the Austrians at the Battle of Fleurus on June 26, 1794, Robespierre was overthrown by a conspiracy of certain members of the convention on July 27. After trying a failed attempt to raise Paris, the Robespierrists and most members of the commune were guillotined on July 28. This led to the Thermidorian reaction, which was a period of relaxation after the Terror. History of "Reign of Terror"
This page was last modified on 4 April 2008, at 00:29.